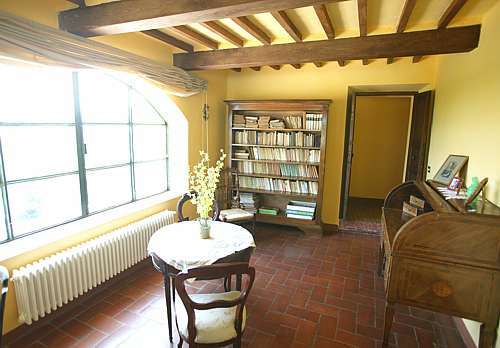 Live the history of Tuscany in this incredible family villa rental set in the town center! 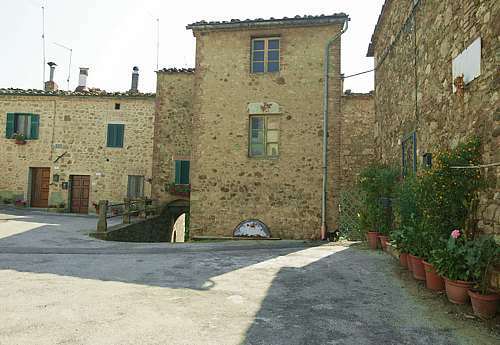 Eight bedrooms and four bathrooms area available for large groups looking to spend their Tuscan holidays in a rental villa full of charm and appeal. Incredible but true - this huge family vacation rental is set in the middle of a historic town with a private garden and pool. A chunk of Siena history at your finger tips. There is a green garden area furnished with tables, chairs and a romantic gazebo for relaxing after a morning of site seeing. 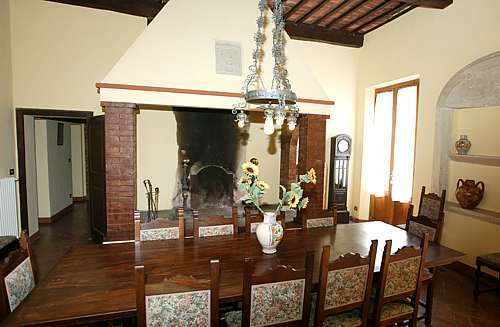 Close to shops, restaurants, cafes, vineyards and not too far off from the Tuscan coast and its sandy beaches. A truly unique villa rental set in the middle of a Medieval town, extra plus is the full size pool in the lovely panoramic garden. 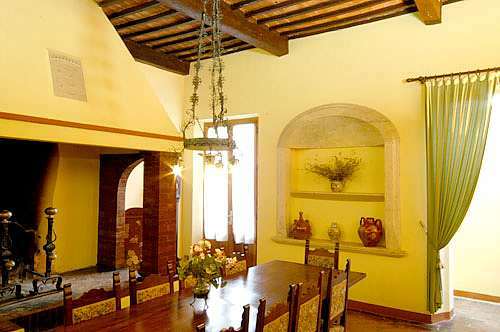 This large villa is a great opportunity to get large groups to visit the Tuscan area yet really experience the enchanting Italian atmosphere surrounding a small town life. Located 60 km far from Siena, this villa offers a possibility of day-trips in Chianti region as like as the uncontaminated southern Tuscany. 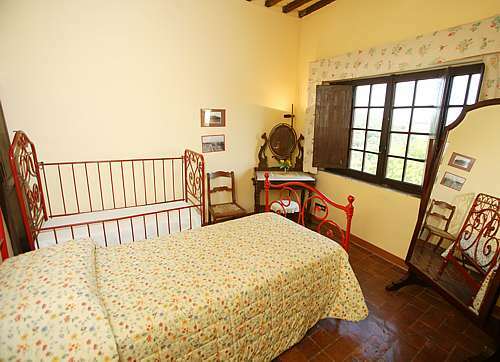 Il Sorbo is a traditional family Villa that represents the typical Tuscan architecture and furniture. The Villa offers a beautiful garden and swimming pool area completely fenced in, with much privacy and spectacular views of the Siennese countryside. The pool area is equipped with tables and chairs for a great outdoor meal, guest toilette, deck-chairs and sun-umbrellas. 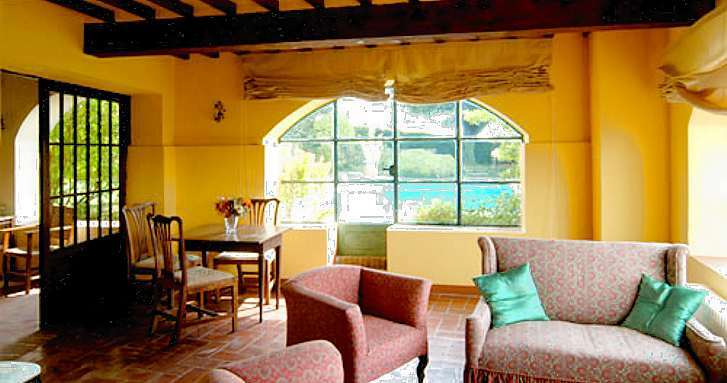 By the pool you enter into a cosy living room with two large arched windows with the pool view. The sitting room by the pool area is equipped with comfortable sofas, armchairs, table and chairs. The is a second room with a ping-pong table for kids and adults to have fun. This is a great area for family and friends reunions, to play cards, to wacth TV or listen to music together. Between the ping-pong room and the external area there is a changing room with two showers and a bathroom. On the lower ground floor there is a very spacious bedroom with a queen size double bed and a great window. 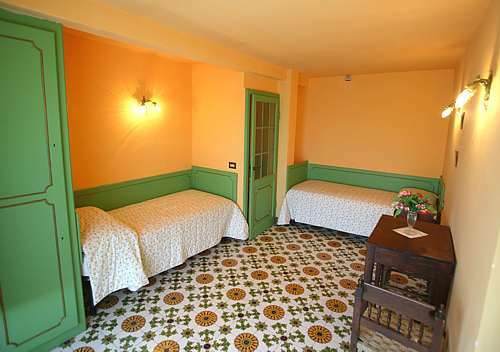 To the left, you have a twin bedroom (the green one) furnished with chairs and a wardrobe. 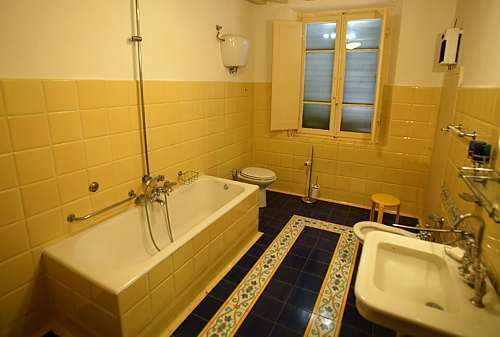 Between them you have the white bathroom, equipped with a bathtub, sink, WC and bidet. The house is built in two levels, because the inclination of the soil. The garden and swimming pool area is located on a lower ground floor. Behind the rose and green bedrooms there is a spiral staircase that takes you to the ground floor. The house has two entrances, from the garden area (lower floor) or from the main square of the town (ground floor). Going ahead on the house's corridors, you have a second single bedroom with a crib. 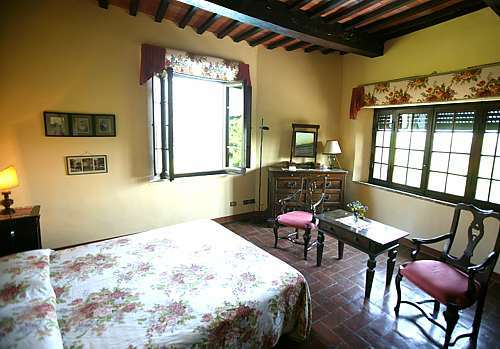 This bedroom has a large window overlooking a beatiful countryside landscape. On the ground floor you have a double bedroom (the red one) with a queen sized double bed and a single bedroom that share one large bathroom (the yellow one) with a bathtub, bidet, WC and sink. 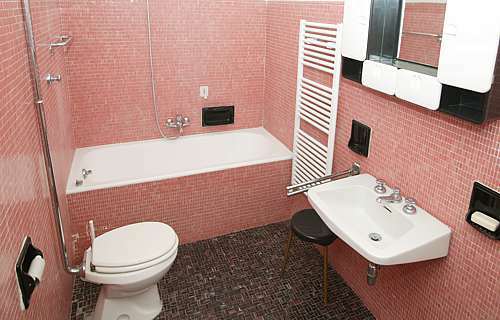 The rose bathroom equipped with a bathtub, sink, WC and bidet is very large. 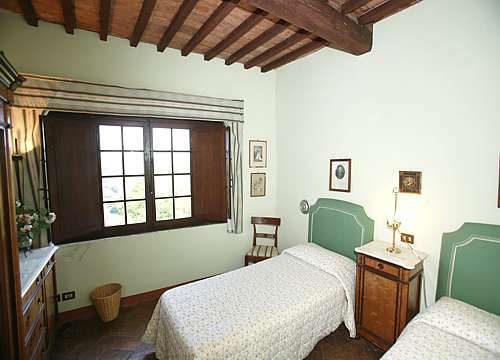 It is located between two twin bedrooms (showed on the pictures below). It is shared from the two twin bedrooms and the single one. 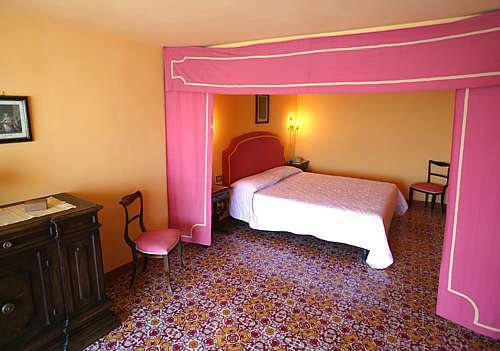 There are two comforable and spacious twin bedrooms, furnished with classical family pieces like mirrors and dressers. Both have windows and are very illuminated. The house preserves much of its original characteristics, for example the fired bricked floor and ceiling and the wooden beams. 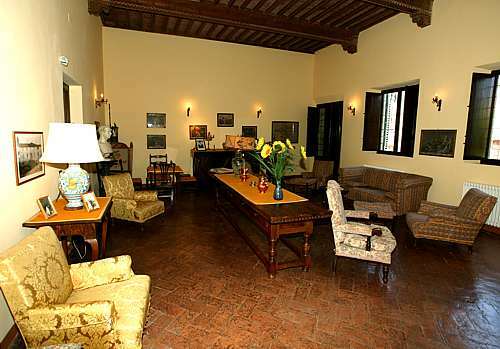 These details of architecture reveals much of Tuscan style, as well as the furniture. 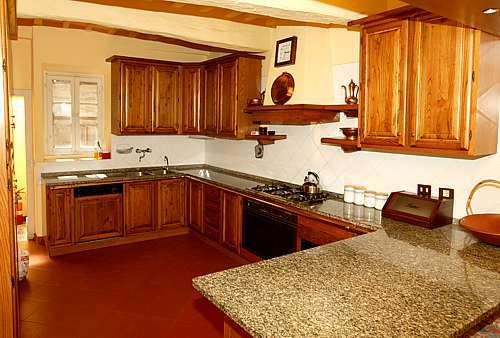 The kitchen, on the ground floor, is spacious and very well-equipped. It is furnished with refrigerator with freezer, electric oven, 6 burner stove, stalinless steel double sink, microwave and dishwasher. There is a large counter with much space to work. In the back there is a laundry with sink, washing machine, iron and board. There is a beautiful large dining room with a massive wooden table that seats the whole group together. Behind this beautiful furniture piece you have the original fireplace that considering its huge size, we understand that this was the old kitchen of the house. 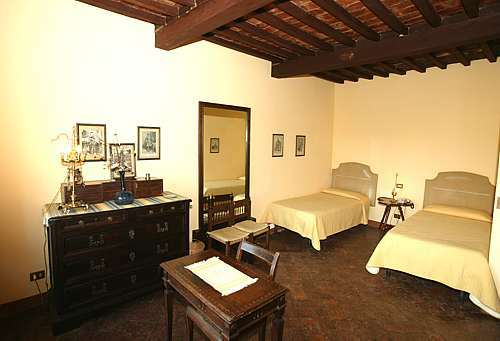 Three extra single beds can be arranged in an extra bedroom with one full bathroom, upon request. This area usually will be kept closed. 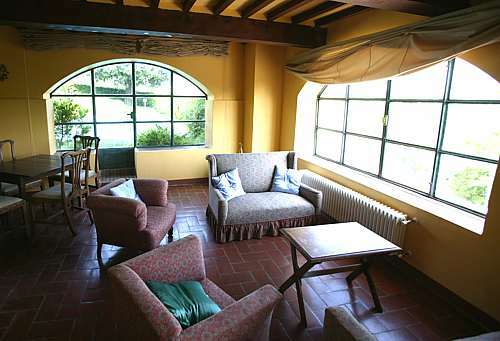 The villa Il Sorbo is located in a cosy town, in front of a nice restaurant and pizzeria. Francesco, the owner of the restaurant can organize for you dinner parties, lunch and much more upon request. It is opened every day for lunch and dinner. Around the villa there is a cosy square with an ancient church and a park where kids can play freely, it is very quiet and nice. The onwer of the villa can help you to program activities nearby. Staying on the Siennese countryside, you can make easy day-trips to Siena or Florence. 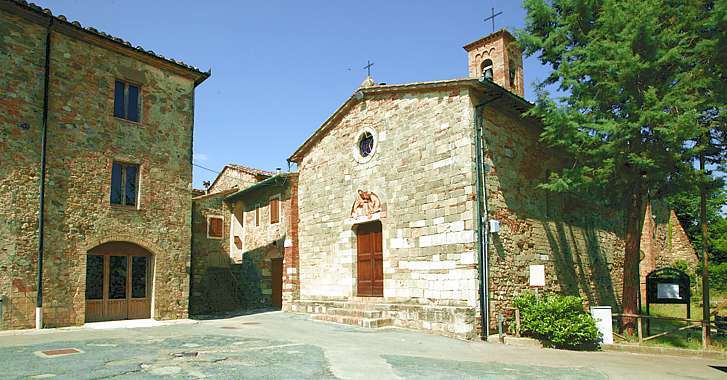 Small towns like Monteriggioni, San Gimignano and Volterra are closeby. 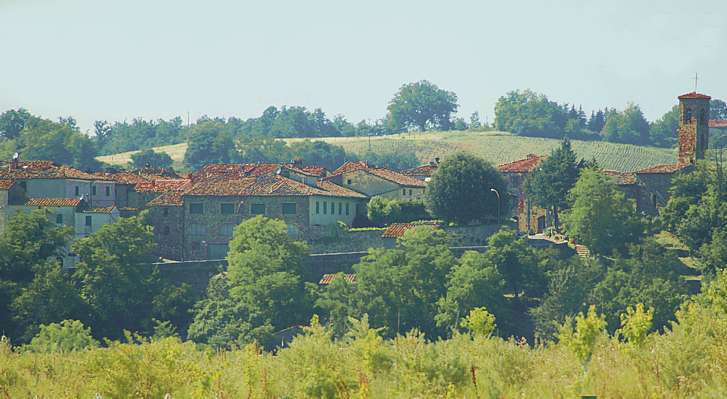 The region of Chianti, between Florence and Siena is reachable in less then an hour and you can visit its wineries and castles. Don't loose a great wine tasting in Castellina, Radda or Greve!